North Korea authorizes light nuclear strike on U.S. I am rushing through security as news break that North Korea authorized a light nuclear strike on the U.S. Equity markets in South Korea plunged on the reports and it prompted the Pentagon to deploy anti-missile defense systems to Guam. This is the strongest indication that the U.S. takes current North Korean threats extremely serious and U.S. Defense Secretary Hagel stated North Korea posed a ‘real and clear danger’. The developments will give business a tremendous boost, but we need to make some adjustments in order to take full advantage of the crisis. South Korea, unfortunately allied with the U.S., has the most to fear as it continues its annual joint military drills with the U.S. and houses 28,500 American troops in South Korea. Threats from North Korea are nothing new, but the regime of Kim Jong Un seems to be more aggressive than his fathers. Kim Jong Un, only 30 years young, is trying to prove his strength and the biggest threat is that he may interpret actions taken by South Korea or the U.S. as extremely hostile and will retaliate with vengeance. 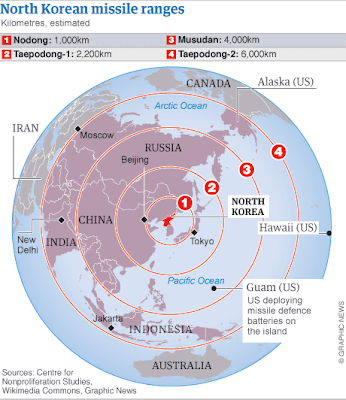 The deployment of the Terminal High Altitude Area Defense System or THAAD to Guam may be enough provocation for North Korea to engage. The U.S. and North Korea never signed a peace treaty and are technically still at war. North Korea cancelled the armistice it signed with South Korea and opened the door for military conflict with its southern neighbor as it may attempt to reunite Korea under its leadership. Hopes for a peaceful diplomatic solution were crushed after North Korea gave South Korea until April 10th to clear the Kaesong Industrial Park which is jointly operated by both countries. Experts including our own CMO as well as me have all reported that the closure of Kaesong may mark the start of a military campaign. The nuclear threat was basically ignored until today when the North authorized a light nuclear strike which means that North Korean scientists may have developed means to make a much smaller nuclear warhead and add it to its conventional warheads in order to create a hybrid nuclear warhead. Either way it is clear that North Korean threats are very serious and today’s authorization for war by North Korea is not to be ignored. North Korea has started to move its missile batteries towards the coast as the North Korean military prepares for war and told South Koreans living in Baengnyeong, a border island, to prepare for the worst. South Korea, backed by the rapidly faltering U.S., hopes that the U.S. will assist them in a full-out war with the North. A believe which may be crucial to their defeat. The U.S. may flex its non-existing muscle through speech and hopes that it will be enough to scare off North Korea, but everyone knows that the U.S. does not have the capability or desire to engage into a war with North Korea which may be assisted by China as well as Russia in such case and nobody wants to start World War III. North Korea is aware that the U.S. will not engage into a war and enjoys the comfort of knowing it can deal with South Korea comfortably. In addition the North is aware of the fact that the U.S. anti-missile defense system is useless and has not intercepted a target since 2008. The next few weeks will be crucial for all of us. David Cameron said that it is important to defend against the North Korean nuclear threat and we have to shift around assets and make sure we will capitalize on the events while we ensure the situation will not escalate further. There will be no war, North Korea only do this for the rest of the world will come running and give them more food, medicine, lift the embargoes, etc. absolutely free just they just stop threatening the world with war. Nrodkorea have no strong army, only a lot of people in them that has not more than a few shots each to their old weapons. Well, there may be no full-blown war but they do have a very powerful military. They may not have the newest technology, but they have a lot of it which is very dangerous.